A webhook is a technique used to send HTTP POST notifications to a URL. They can be used to connect apps together or just send data. Read more! 1. Open your form in the form builder and click on the settings tab, go to the integrations section and search WebHooks or filer the result in the drop down with "Other". 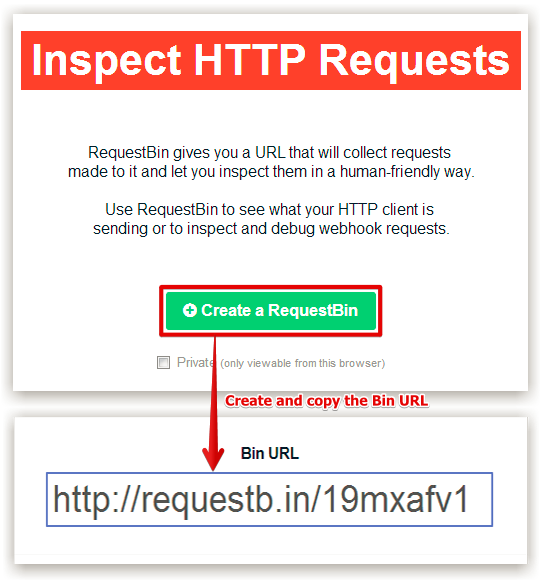 To easily find out/debug a webhook request e.g. 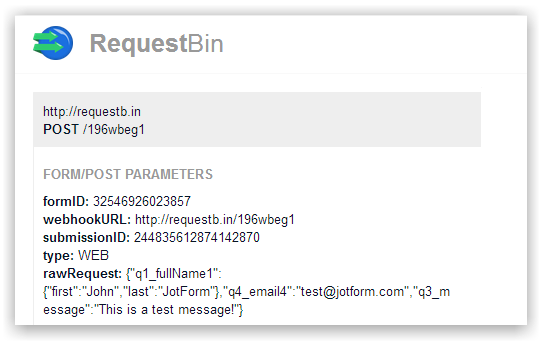 form field names & its sample data, you can use RequestBin. 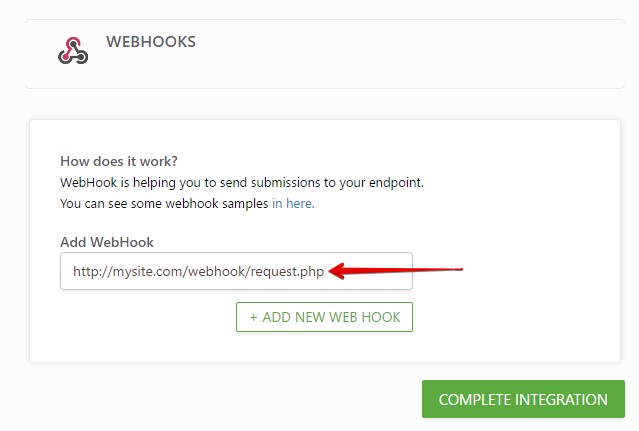 Simply create a requestbin URL and set it as your form Webhook (as seen in the screenshot above). Make a sample submission to your form and requestbin will automatically collect the data and print it in a human-friendly way. Here's an example PHP script that you may want to try on Webhook. This is a simple mailer script that will send the form submissions data to your email through Webhook http://pastebin.com/raw/AmG72bve. Make sure to replace the field names and emails with the one from your form, you can also add fields if you prefer. Can someone help me how to do this in step-by-step. I had created a form in jotform and I want also that someone who submitted my form will receive a text message. How do i send this post data in json format instead of multipart form?? It is not readily obvious what the field names are when parsing the rawRequest from the $_POST. It would be extremely helpful to have a procedure that builds php variables automatically. So where does this code above go to? To ASP default.aspx or? Is is possible to set a secret key to authenticate against an API? I am attempting to set up a direct integration to webmerge.me, but the problem appears to be the lack of ability on Jotform's end to generate the proper POST command with name/value pairs. Am I missing an option somewhere or is the POST command simply immature at this time? How I can integrate my python code with jotform? Feature Request: How can i link my form to Viral Loop platform?